I’ve been exploring some new ways to present smaller work. I had a local gallery show last fall, and I was unimpressed with the way that my small pieces looked in that setting. I attached hanging sleeves to some of my smaller work, and I don’t like it for the really small stuff. I really enjoy working small, and the pieces are much more affordable for buyers, so I really need to find a way to present them! I attached my journal quilt 47/52 2008 with acid free YES! paste to an archival artist’s panel. I then used a “shadow box” frame from Michael’s to house the panel so that it had some space between the artwork and the glass. This solution cost me about $11.00 for the canvas panel and frame (with the frame 40% off). I definitely like the way it looks framed, and I like that the work is ready to hang for the buyer, but this solution is a bit expensive. 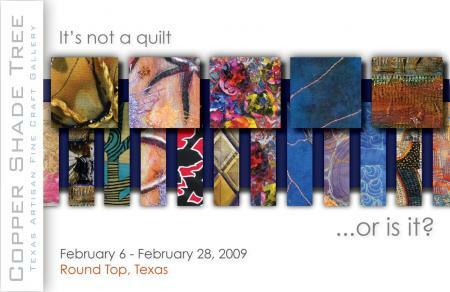 This piece just went to the Copper Shade Tree Gallery in Round Top, Texas for the “It’s not a quilt…or is it? show in February. I’d also like to send a shout out to my fab husband for dropping them off on his trek to work, which saved me several hours of driving! P.S. Don’t you just love the little bit of green wall peeking out the photo? I heart our house paint colors. This is my weekly journal quilt 41/52 2008, 6″ x 8″. This was a fun piece! I really liked the design of my journal quilt 40/52, with it’s fused organic flower/leaf shapes, but I wanted to try it in different fabrics/colors. I found a batik that really resonated with a piece of fabric that I had first hand dyed a blue-green color, and second rusted. Together, with the rust, I like how they depict the decay of fall. For this piece, I stitched a spider web of sorts with purple variegated thread to a piece of fabric that I dyed and rusted. The batting and backing were already in place at this time. I fused wonder under to the back of the brown multi-colored batik. 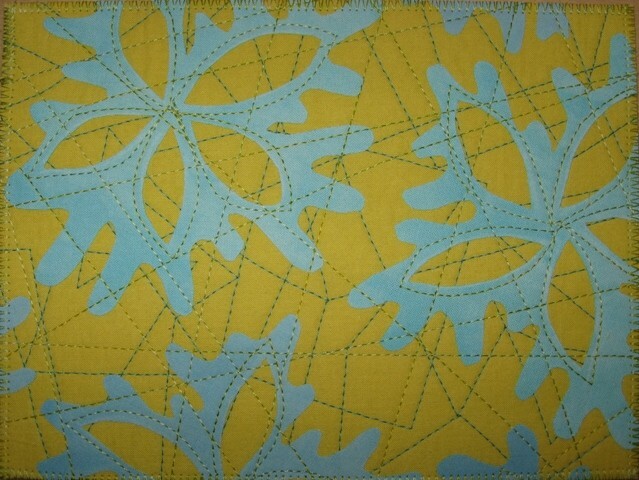 I cut out the shapes of the flowers/leaves from the batik and fused them to the dyed/rusted fabric base. 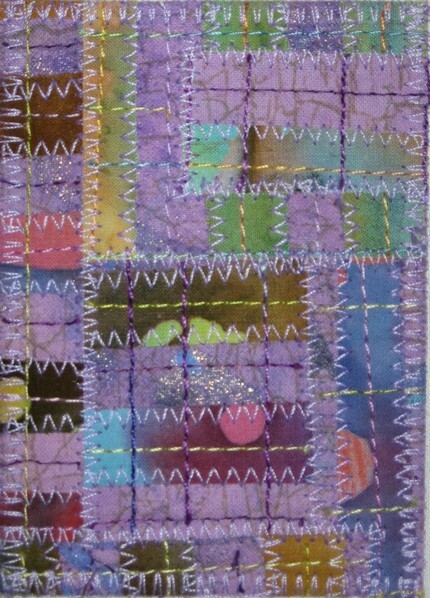 Then I stitched over it with a yellow variegated thread. I finished it with a zig-zag stitch all around the edges. I enjoy the resulting piece and it’s colors and shapes. So, I decided I wanted to make a larger piece based on this journal quilt. Here’s the rub. I had literally no idea what colors I used to dye the piece of blue-green hand dyed fabric that I rusted last week. So I have spent most of last weekend and this week testing dyes and mixtures to identify what in the world I did to get that color. Lesson learned: I should really write down what type of fabric I dye, it’s dye mixture, and keep a tiny sample of the piece of fabric in my sketchbook. The picture below shows a stack of things I dyed this week. It’s only one stack, there’s more. In case you’re curious, I did finally figure it out on Wednesday, or well, close enough. It’s mostly teal blue with a little cayman island green. I am about to send that piece of fabric into it’s rusting process so I can get it ready to start the big piece! My journal quilts are for sale for $30 each in my etsy shop.